I've been trying to understand how the PDSI seems to suggest that the land is on the whole drying out as a result of global warming (though there are regional exceptions), while in the paleo-climate, warmer periods were generally wetter, and colder periods drier (and in more modern times, for example, volcanically caused reductions in sunlight resulted in global droughts). There would appear to be a contradiction: why won't a globally warmed world be wetter, not drier? Here is a speculation about it. Bear in mind the usual caveat that I'm not a climate scientist - just a non-specialist (albeit with a Physics PhD) trying to understand the implications for humanity. 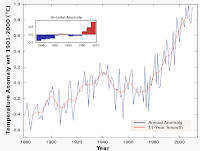 The two temperature series shown above represent the global land temperature (on the left) and the global ocean temperature (on the right) - the figures come from the Wiki article on the instrumental temperature record. To crudely summarize, the ocean has warmed about 0.7oC since the pre-industrial era, while the land has warmed about 1.3oC. Thus the land has warmed 0.6oC more than the ocean over the twentieth century. The reason for this is that as we have thickened the CO2 blanket over the planet, and thus warmed it, the oceans and land have responded differently. The ocean, because it's a liquid which will allow convection, can transport heat into its depths much better than the land in which the heat must very slowly diffuse down through the layers of rock and soil. Thus the land has warmed more, but only to a shallow depth, while the ocean has warmed less but deeper. 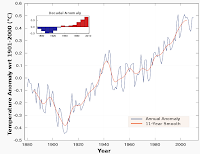 Since this fundamental issue will still apply as the planet gets further and further out of thermal equilibrium over the twenty-first century, we would expect the temperature gap between land and ocean to widen further and further until it is several degrees centigrade. The global water cycle basically consists of water evaporating from the ocean, being transported to the land, falling as rain or dew, and then running off into rivers (I'm oversimplifying but that's the essence of it). So the ocean is the source of the moisture in the atmosphere and the land is a moisture sink. "There would appear to be a contradiction: why won't a globally warmed world be wetter, not drier?" Personally, I hesitate to extrapolate too much from historic examples. The face of the planet has just changed too much since the dawn of industrial society. For example large portions of the earth are now "hardscapes" that prevent rainfall from being absorbed into the soils below. What I imagine is happening in some areas is a sort of "short circuit" in the hydrologic cycle, where liquid water that should infiltrate into the landscape is being diverted directly back into surface reservoirs (like the oceans). Where I live, anecdotal evidence is already piling up that less water is reaching the subsurface strata where it can "recharge" local ground water resources. Additionally, I believe there is a sort of "lock in" effect whereby the atmosphere - as it warms - retains a much greater absolute quantity of water in the form of vapour. By the way, thanks for the great series of posts. This is a very interesting hypothesis. One question though (also coming from a very-much non-climate scientist). Due to ice-albedo amplification and other factors, high latitudes are supposed to warm much more than lower latitudes. Presumably, this would also mean greater differences between land and water temps at high latitudes, and thus greater changes in relative humidities at high latitudes than at low latitudes. So why does the PDSI prediction map appear to show something rather different? Good post. 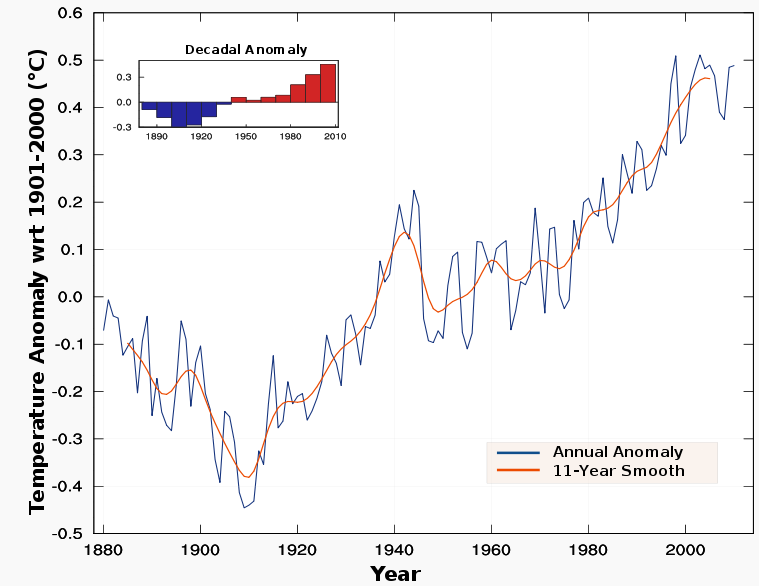 It illustrates that the problem with global warming is not the level of the global temperature but its rate of change. If we think of drought severity as being the degree of stress on plants, we need to consider transpiration. The PDSI is an index of the gap between supply and demand, after all. Off the top of my head I'd expect that decreased relative humidity would increase the water "potential gradient", increasing the flow of water through plants from ground to atmosphere. I'd also expect that higher temperatures would directly increase the water demand of plants, through increased metabolic rate and other mechanisms. On consulting Wikipedia on transpiration, "water potential gradient" is listed as dependent on relative humidity. Wiki also says there are two other factors, directly dependent on temperature: increased rate of diffusion of water molecules (out of leaf surfaces), and increased rate of evaporation. The latter would decrease the recharge of aquifers, and reduce the length of the rain-fed growing season in regions with a pronounced wet season - dry season climate, because less water would percolate into soils. So I expect there to be a super-linear effect on plant stress from the expected temperature and relative humidity changes. Don't forget the accelerating effect of reduced albedo over land as annual snow/ice cover rapidly recedes. Both due to warmer temperature AND due to reduced precipitation. The drier the climate, the less precipitation, the lower the albedo, the hotter the land relative to ocean, the drier the climate. This weather volatility will be a nightmare to manage as we will have to invest in water infrastructure that can cope with extremely divergent annual outcomes. Chapter1 - sharp observation. One point is that the climate models actually do a poor job of capturing the regional patterns of drying. If you look at the top map in this post that shows the latest observed trend in PDSI and that can be seen to be much more uniform (with some splotchiness) than what the climate models think should be happening. Still that leaves your point intact since if the land/ocean temperature difference were the only thing going on we'd expect more drying at high northern latitudes. One obvious confound is the lessening ice cover over water at high latitudes which is providing a bigger source of moisture (eg more lake effect snow in the Northeast US). In general this is a zero-dimension model and the real world is bound to be much more complex. Still - your point is well taken and I'll bear it in mind. "Simple statistical analysis shows that the relationship between sea ice variability and the winter climate is not clear and is much weaker than between snow cover and winter climate. Therefore it will be very difficult to isolate a sea ice signal in the winter climate using observations alone. The reason why I believe that snow cover has the cleanest signal with the winter AO, from the stratosphere to the earth’s surface, more so than any other boundary forcing is because its variability lies between 40-80 degrees North." There are some very interesting slides in there that may have some pertinence to this topic (and many others that aren't pertinent but very interesting nevertheless). The slides on pages 29 and 30 show projections of PDI and temperature change pattern. I'm not really sure how to interpret all this but one thing is for sure, the complex dynamics of climate change are difficult to fathom and as time passes increasing comlexity will only make the process of understanding more difficult. Actually fond a little paleo-precipitation data based upon pollen in Africa. At first glance, it seems to contradict the idea that there is less moisture during rapid warming. In the critical period about 11.5k and 12.8k years ago, the precipitation anomalies tend to show more rain during the warming even and less during the cooling event. But - the data is noisy and timing is critical for such a comparison. 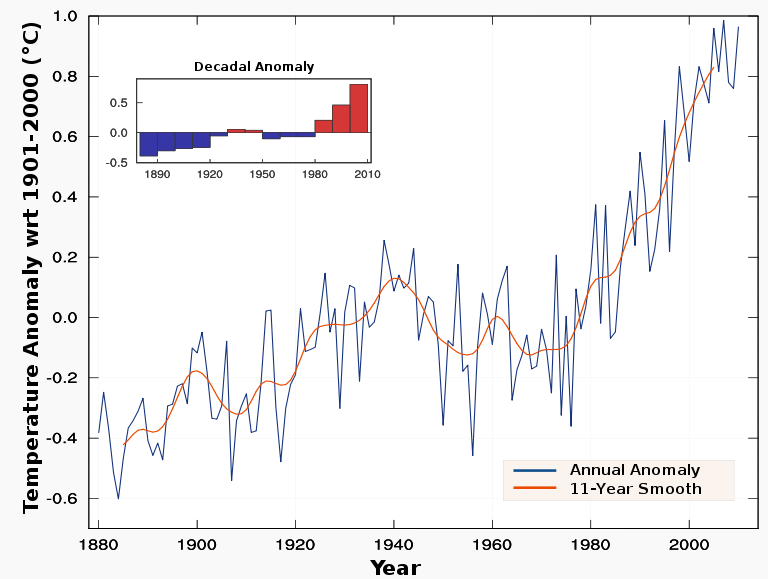 I don't understand why you don't send this to one of the guys at realclimate.org and ask them what they think of your hypothesis. You've gotten some interesting comments but what exactly are you looking for as far as feedback exactly? I understand your argument, but this is kind of a tricky field and it is easy to be wrong. So I don't really feel I can contribute anything to a conversation on this. It's definitely possible, but for the most part people who post here aren't doing anything other than making erudite guesses. Meanwhile there are all kinds of experts out there who work in this field daily. The land is drier, because warmer air holds more moisture. Liquid water levels on the surface drop, lowering the water table. You might think that more moisture in the air means more precipitation, but it doesn't. The moisture just stays there, for the most part. What will happen is that when it does rain, it will pour. Frankly, I'm not sure to what degree examination of paleo-data is relevent to modern day climate change processes at all. Surely there is some relevence, but how useful are projections that are based off of a spotty knowledge of events that occured so far in the past and under radically different conditions? Earth systems are inherently chaotic. Is it not hubris to consider it possible to define with any useful certainty something as complex as a future climate system using the tiny handful of macroscopic detail we posses about the past? Certainly projections are useful in context but regardless of how much time and effort go into a particular model aren't they all just erudite guesses? Again, I'm not suggesting that attempting to understand the past won't help us to understand the present and the future, but shouldn't we be careful to keep our minds open to a wide spectrum of possibilities?